Monsanto’s patented the genes of their GMO pigs. Now if your pigs have these genes in them and every pig on this planet has them, then you will – theoretically for now – have to pay a fee for every piglet you raise on your farm, even if those pigs belong to a very old race that had nothing to do with Monsanto’s GMO pigs. Monsanto wants to achieve the same now with ‘ancient’ taro from Hawaii. 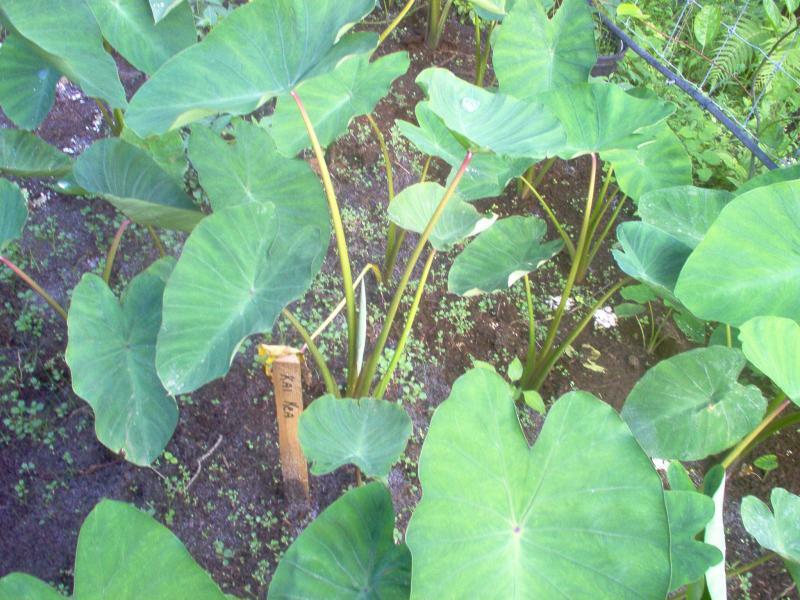 If you would give your neighbor 10 taro saplings from your garden then you will have to pay a fee for that to Monsanto. Monsanto’s GMO taro also threatens to alter/destroy the genetics of different varieties of taro plants on Hawaii, which have been cultivated there for thousands of years. The organic farmers on Hawaii also have to test their papaya plants to prove that they do not have any GMO genes in them because otherwise Japan won’t buy Hawaiian fruits and vegetables! WAILUKU – A Maui County Council committee picked up Thursday where it left off six weeks ago to discuss a bill to prohibit genetically modified taro in Maui County. Economic Development, Agriculture and Recreation Committee members got close to passing the measure, but instead the panel’s five members voted unanimously to forward the “confusing” issue to the entire nine-member County Council. “So everyone can get an opportunity to participate in the discussion,” committee Chairwoman Jo Anne Johnson said. The committee was unable to arrive at a consensus even after hearing dozens of testifiers and receiving hundreds of e-mails in support, said Council Member Bill Medeiros, who grew up in Hana eating taro and introduced the ban. It is essential to protect the sacred and healthful staple of the Native Hawaiian people, he argued. However, Mayor Charmaine Tavares appears to be lukewarm to Medeiros’ plan to protect taro. The mayor sent a letter to the committee, stating that she does not support a ban against genetic modification of taro, at least for now. Tavares said the law would be unenforceable because there are no “reputable scientific tests” to distinguish between authentic and genetically modified taro. Instead, Tavares said she preferred committee members defer the bill until the council, her administration, state lawmakers and federal and state agricultural officials find a solution. “I don’t get these lamebrained excuses about enforcement,” said longtime Native Hawaiian activist Walter Ritte of Molokai. Medeiros’ bill would make it illegal for any person to test, raise, grow, transport or release genetically engineered taro. The penalty would be a petty misdemeanor punishable by a fine of up to $1,000 and 30 days in jail. Lucienne de Naie of the Hawaii Sierra Club said a law in itself can be a powerful deterrent. Dr. Lorrin Pang, the Maui District health officer, said there are plenty of people in Maui County who would volunteer to help enforce the law, including himself. Genetically modified taro can be distinguished from natural taro, he said. Ritte also questioned why representatives of agricultural giant Monsanto Co. were present at Thursday’s hearing. Monsanto employs about 600 people on Maui and Molokai to produce genetically modified corn and soybean seeds. Fred Perlak of Monsanto said the company has no plans to test taro but worried that a GMO taro ban could lead to similar legislation against other crops. A statewide taro genetic-modification ban narrowly missed passage this year in the state Legislature. Chris Hamilton can be reached at chamilton @mauinews.com. Unlabeled GMO food causes allergies doctors cannot diagnose such as Morgellons.